Horst had fallen foul of the authorities in Kona on the big island of Hawaii. Refused entry into Honokohau Boat Harbour, Awanesa had been directed to Kailua Bay by the harbourmaster where, Horst was told, he could drop an anchor. He set his anchor in the designated area as instructed but, unfortunately for Horst, Awanesa’s chain swung when the wind changed, dragging over live coral at the moment a conscientious and enthusiastic eco tourist was photographing the wonderful sea life that lives in Kailua Bay. The swimmer caught it all on film and promptly informed the Division of Parks & Ocean Recreation who subsequently called the police. Only the previous day, the State of Hawaii had issued a new law protecting coral. Poor Horst, the German who spoke with a severe speech impediment, was duly issued with a citation and summoned to appear in Court. He was distressed and distraught. Every condemned man needs a champion to fight his cause against his hanging. We’ve seen it countless times in the movies and on TV. The hapless victim sits terrified before the all white jury who’ve already condemned him, the brilliant lawyer stands and strides around the court, makes an impassioned speech and everyone in court, including the jury, stand and cheer and the judge bangs his hammer down hard freeing the condemned man. Luckily for Horst he had Eric Two Corks, the mercurial Texan, on his side. I followed Eric through the imposing court house doors and listened intently as he informed the security guard we were here to right a ferocious wrong. Floor 3, we were told. We strode purposely to the elevator, with Horst in tow, and presented ourselves to the Court Clerk at the counter. Eric instructed Horst to say nothing which, in any event, was irrelevant as Horst’s English was almost unintelligible with his impediment. Both Eric and I could understand him but it took time. Eric designated myself as Horst’s official translator which was duly noted by the Clerk of the Court. This, I beamed proudly, was going exceedingly well. Horst forlornly sought legal advice from a Lawyer but was told the costs would be prohibitive. No matter, Eric decided, he would call a council of boat skippers residing in Ala Wai Boat Harbour… our combined maritime knowledge would outstrip the expertise offered by any obscure suburban lawyer. Of course, Eric Two Corks was unquestionably right. Every skipper invited to the discussion eagerly contributed his opinion, myself included, and the question of coral survival didn’t feature much in our fiercely opinionated world. By this time Horst was feeling confident he would escape his lynching, but what would happen, he worried, if he left Hawaii for Alaska with a criminal record? Eric played his masterstroke, pulled the card from up his sleeve and went to consult the legal mind of Mac McDonald onboard Why Not. The full story of the trial of the unfortunate Horst, skipper of the German yacht Awanesa, can be viewed and read at noonsite.com and at sail-world.com. Meanwhile, life in Ala Wai goes on. My very good friend Eric Two Corks will leave one day soon, with Claudia and his surf boards aboard Maluhia for the Marquesas Islands, south of the equator. Sergio the Sailor and Impulse are heading south too and I’ve heard rumours Maluhia and Impulse may sail south together. We ourselves are leaving to go north to British Columbia and to Alaska. Horst is heading north too, to Alaska on Awanesa with his new puppy dog Ginger. 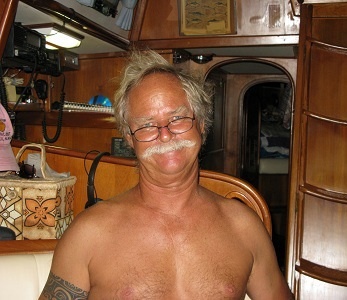 Peter, skipper of the New Zealand yacht Salamander has already departed for the Aleutian Islands and the wily old surfer Bill, skipper of Pegasus will stay in Honolulu with Shirley. Fat Annie left for Mexico and it’s yet another sad, sad parting of the ways.